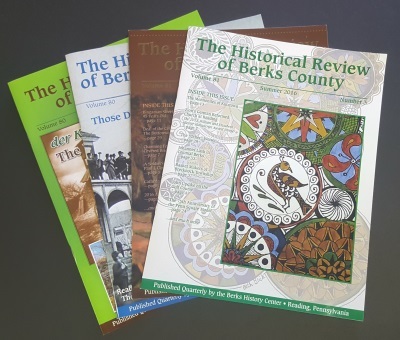 The Berks History Center offers guided tours for students in elementary, middle and high school, as well as college-age students. Home-schooled children and scout groups are most welcome. Pre-school age children are invited to visit the Hands-On History Room and a shortened tour of the museum. Guided tours are also offered to adult groups including assisted living facilities and senior groups. Museum admission is $2 per person for guided tours for groups. A ratio of one accompanying adult per six students is required for children ages seven years and younger, and a ratio of one adult per ten students is required for children ages eight and older. Guided tours are conducted by professionally trained volunteer docents as well as the Education Curator of the Berks History Center. To schedule a tour for school, college, home-school or adult groups contact Vicky Heffner, Education Curator, at education@berkshistory.org or 610.375.4375. Once your reservation is made, a confirmation of your guided tour will be sent via e-mail. Please ensure that all information is correct and if it is not, please contact the Berks History Center immediately. Payment can be made day of tour with cash, check or credit card. Groups will be charged only for the number of persons who are present for the tour. For groups arriving by bus, please drop off directly in front of the museum on Centre Avenue. The bus will need to park further down the street. If arriving by car, street parking is ample directly in front of the museum on Centre Avenue, behind the building on Second Street, and groups can also park in the lot surrounding the Henry Janssen Library located on Spring Street. For persons requiring handicapped accessibility, park in the lot or on Second Street and enter the building by the side door. The Education Curator will greet your group upon arrival. The Berks History Center is now recognized as an Educational Improvement Organization. Please inquire about assistance with busing and admission fee waivers for your school group. The Berks History Center’s Junior Historian Camp is held the last two weeks in June, Tuesday-Thursday, 9:30 am to 3:00 pm. Cost for this camp is $50. Members of the 1776 Club (Berks History Center’s junior historian club) pay only $35. To register your child for either the Junior Historian Camp and/or the 1776 Club, contact Vicky Heffner, Education Curator, at education@berkshistory.org or 610.375.4375.